Comet 215097A Spring Kit - Silver (SMALL) for Comet 94C Duster Series. 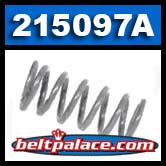 Comet 215097A Spring Kit - Silver (SMALL) for Comet 94C Duster Series. Fits 94C Models: 206094A, 206096A, 209942A, 211493A, 211879A. Comet 205819A. Green Comet Duster 94C clutch spring. Comet 205819A. Comet Industries 94C Series Drive Clutch Spring, Green. Comet OEM Part 205819-A. Comet 206094A. Comet Industries 94C Duster Drive Clutch. TAPERED BORE (30mm).